The location of the find – the horizontally hashed areas show an area of reclaimed land which was previously part of Lough Foyle. The torc and the bowl. The smaller parts that made up the model of the boat. 1. Boat hook 2. Mast yard 3. Steering oar 4. Small grappling iron 5. Forked implements 6. Square ended oars 7. oars. The Broighter Gold or more correctly, the Broighter Hoard, is a hoard of gold artefacts from the Iron Age of the 1st century BC that were found in 1896 by Tom Nicholl and James Morrow on farmland near Limavady, in the north of Ireland (now Northern Ireland). 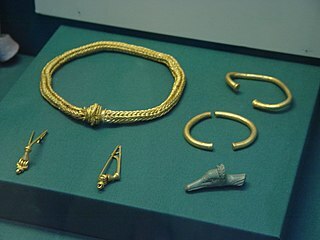 The hoard includes a 7-inch-long (18 cm) gold boat, a gold torc and bowl and some other jewellery. A design from the hoard has been used as an image on the 1996 issue of the Northern Ireland British one-pound coins and the gold ship featured in a design on the last Irish commemorative one-pound coins. The Broighter Collar and Broighter Ship also featured on definitive postage stamps of Ireland from 1990–1995. The National Museum of Ireland, who now hold the hoard, describe the torc as the "finest example of Irish La Tène goldworking". Replicas of the collection are kept at the Ulster Museum in Belfast. The hoard was found near Lough Foyle in a field in the townland of Broighter (Irish: Brú Íochtair, meaning "lower fort") 2 km northwest of Limavady in County Londonderry. It was discovered by Thomas Nicholl and James Morrow while working as ploughmen for Joseph L. Gibson in February 1896. They found the hoard whilst double ploughing. That means that one plough would follow the other to gain extra depth. It was estimated that the finds were buried 14 inches (36 cm) deep and were in close proximity to each other. The find was taken to the farm where Maggie (later Mrs Nicholl) washed the items in a sink. At that time they did not realise they were made from gold. The hoard was eventually sold to the British Museum for six hundred pounds. It consisted of a miniature ship, complete with fittings and oars; two necklets, a bowl and a torc (or hollow collar). The find was described as a lump of mud when initially shown. Moreover, the boat had been so badly damaged by the plough that it took a goldsmith to later work out its structure. Part of the boat, a thwart, was found a few days later and sold by Morrow's sister to a jeweller in Londonderry. The gold in the hoard all has the same metallurgical character, despite the diverse styles of the pieces. Some appear to be imported, while others may be reworked or entirely remade. The boat is a unique find that was measured at 7.25 inches (18.4 cm) by 3 inches (7.6 cm) and weighed 3 ounces (85 g). It had benches, rowlocks, two rows of nine oars and a paddle rudder for steering. It also included tools for grappling, three forks, a yardarm and a spear. The tools are of much lighter design than the ship's hull and are shown in the illustration. The boat suggests that the hoard was a votive deposit to the Celtic sea god Manannán mac Lir. 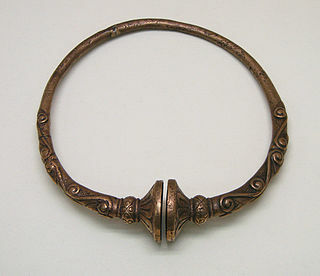 The other remarkable item was the torc or collar which is 7.5 inches (19 cm) in diameter with buffer terminals, using a mortice and tenon fastening. The hollow tube that made up the ring is 1.125 inches (2.86 cm) in diameter. The hinge is no longer there but it would have been required to put on the collar. The fastening consists of a "T" piece which fits into a slot as the torc is closed. A section can then be turned which captures the "T" and prevents it opening. The design has been applied in three ways, the most common is where the classical designs of generic plants has been revealed by beating back the surrounding gold. Other areas have additional pieces attached and the background has been incised in geometric curves to add to the decoration. 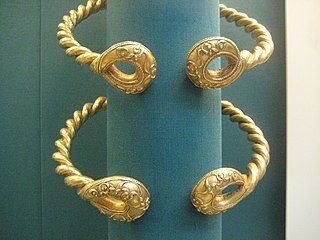 There are no comparable La Tène style hollow torcs known from Ireland, although somewhat similar examples such as the Snettisham Torc are known from Britain in this period. The design on the torc can be studied easily by imagining the hollow tube as straightened and flattened. This was done in the first study of the hoard by Arthur Evans and his drawing can be seen here. The design matches other Irish pieces, and may have been a remodelling of a plainer British or Rhineland torc (the Rhineland is one possible source of the gold). An unusual gold bowl or model cauldron which was made from a single sheet of gold was discovered. Its purpose is unclear but it was probably a model of a large cauldron, which was an important object in the feasting culture of Iron Age Europe. It had four suspension loops on the outside, not all surviving. It is 3.5 inches (8.9 cm) in diameter and is about 2 inches (5.1 cm) deep. It weighs over 1 ounce (28 g). Hanging bowls were later to be a distinctive feature of post-Roman British and Irish art, often thought to be a speciality of Celtic areas. There are two chain necklaces, using loop-in-loop technique, with clasps. One is 39.6 cm long, with triple chains, the other with a single chain but of more complicated construction. The chain technique spread from the Middle East to the Roman world, where these were probably made; the clasps match Roman and Etruscan examples. 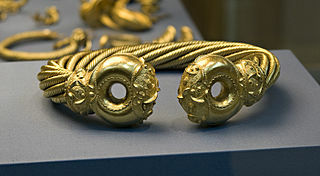 There are also two torcs made from single twisted bars of gold, a British style. One is complete, with a diameter of 18.6 cm, the other a semi-circular fragment. Despite unusual hook-in-loop fastenings and other features, these are probably imports from what is now south-eastern England. The hoard was sold by the farmer, J.L.Gibson, to a jeweller in Derry who sold it to a local antiquarian, Robert Day. He sold it to the British Museum for £600. The museum had undisturbed ownership until the renowned Arthur Evans wrote a paper describing the find in 1897. The drawing of the torc design comes from this paper. The Royal Irish Academy disputed the British Museum's view that it was an ancient gift to the gods and launched a long running court case. The Academy wanted the finds to be declared treasure trove, that is, buried with the intention of recovery. Day, the antiquarian, was so aggrieved to have his sale disputed that he withdrew a gift he was going to make to the Irish Academy. It was argued that the model of the boat and the "sea-horse image" on the torc when combined with the finding of nearby shells showed that the treasure had been placed in water deliberately as an offering to ancient gods. The map above shows how close the find was both to the sea and to reclaimed land where the railway then travelled. The British Museum's position was set out by Evans who had described the find as votive in his 1897 paper – ironically something the Academy's successor, the National Museum of Ireland, now consider likely, saying on their website: "The objects may have been buried as an offering to a Celtic god, presumably during the first Century BC". The dispute was finally settled by a court in London in 1903 in an important case where the government was represented by Sir Edward Carson, who was a Unionist and Solicitor-General. A pivotal issue in the case were that the finds were all closely packed which was indicative of burial. It was held that the treasure was not a religious offering and was therefore forfeit to the crown. The treasure was taken to Dublin and placed in the museum there. Although some[who?] have suggested that the gold should be transferred to nearer their find-spot in what is now Northern Ireland, the items remain in the National Museum of Ireland in Dublin. The hoard is considered an important find. The National Museum of Ireland believes that the collar is the "finest example of Irish La Tène goldworking" in Europe. The eclecticism of the styles is comparable to that of the objects in the Stirling Hoard from Scotland, probably from a slightly earlier period. The torc was incorporated into a 1996 design for a British pound by Norman Sillman and the boat was used as a basis for the design for the last pound coin ever issued by the Irish Mint. This coin was issued to celebrate the millennium in 2000. ^ a b c "Broighter Collar". Encyclopedia of Irish and World Art. visual-arts-cork.com. Retrieved 24 July 2010. ^ Broighter/Brú Íochtair Placenames Database of Ireland. Retrieved: 2011-05-31. Summary of facts and correspondence with respect to Celtic Ornaments found in 1896 at Limavady in north west of Ireland. Command papers. Cd.241. London: HMSO. 1900. Retrieved 10 September 2016. Wikimedia Commons has media related to Broighter Gold. The Gold lunula is a distinctive type of late Neolithic, Chalcolithic or early Bronze Age necklace or collar shaped like a crescent moon. They are normally flat and thin, with roundish spatulate terminals that are often twisted to 45 to 90 degrees from the plane of the body. Gold lunulae fall into three distinct groups, termed Classical, Unaccomplished and Provincial by archaeologists. Most have been found in Ireland, but there are moderate numbers in other parts of Europe as well, from Great Britain to areas of the continent fairly near the Atlantic coasts. Although no lunula has been directly dated, from associations with other artefacts it is thought they were being made sometime in the period between 2200–2000 BC; a wooden box associated with one Irish find has recently given a radiocarbon dating range of 2460–2040 BC. The Newark Torc is a complete Iron Age gold alloy torc found by a metal detectorist on the outskirts of Newark-on-Trent, Nottinghamshire, England, in February 2005. The list of hoards in Ireland comprises the significant archaeological hoards of coins, jewellery, metal objects, scrap metal and other valuable items that have been discovered on the island of Ireland. It includes both hoards that were buried with the intention of retrieval at a later date, and also hoards of votive offerings which were not intended to be recovered at a later date, but excludes grave goods and single items found in isolation. The list is subdivided into sections according to archaeological and historical periods. Gold working in the Bronze Age British Isles refers to the use of gold to produce ornaments and other prestige items in the British Isles during the Bronze Age, between circa 2500 and c.800 BCE in Britain, and up to about 550 BCE in Ireland. In this period, communities in Britain and Ireland first learned how to work metal, leading to the widespread creation of not only gold but also copper and bronze items as well. Gold artefacts in particular were prestige items used to designate the high status of those individuals who wore, or were buried with them. The Lochar Moss Torc is an Iron Age brass torc or neck-ring found in Lochar Moss, near Dumfries in Scotland. It was found by chance in the early nineteenth century and was later donated to the British Museum. The Great Torc from Snettisham or Snettisham Great Torc is a large, Iron Age electrum torc or neck-ring that is the most spectacular object in the Snettisham Hoard of Iron Age torcs and other metalwork found near the village of Snettisham in Norfolk, East Anglia. The perfectly intact torc is outstanding for its high level of craftsmanship and superb artistry. Soon after its discovery this elaborate collar was acquired by the British Museum. The Leekfrith torcs are four Iron Age gold torcs found by two hobby metal detectorists in December 2016 in a field in Leekfrith, north Staffordshire, England. The find consists of three neck torcs and a smaller bracelet, which were located in proximity to each other. They are believed to be the oldest Iron Age gold jewellery found in Britain. Subsequent archaeological examination of the area did not uncover further objects. Broighter is a townland in west County Londonderry, Northern Ireland. It lies 4.4 miles (7 km) northwest of Limavady and 2.5 miles (4 km) northeast of Ballykelly. Broighter is part of Causeway Coast and Glens district.